Choose an existing design or create your own to enjoy as a bar unit, change room, storage or pool equipment housing. Anything is possible. We create cabinets, counter tops, finish the inside of the units upon request and use the finest materials like Western Red Cedar, or pre-finished Fraser siding. 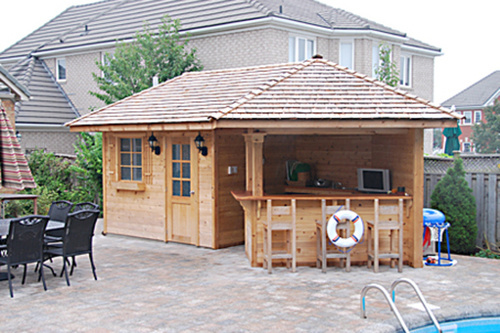 The convenience and beauty of a cabana keeps pool equipment and garden supplies neat, tidy and protected. As well, the bar units will give you hours of enjoyment and the focal point of your next pool party.